Place the cubed butternut squash in a sauté pan on medium high heat with 2 tablespoons of butter- season with salt and pepper. Once the squash begins to caramelize, place in a 350-degree oven for 30-40 minutes, or until tender. Remove from the oven, and blend in a food processor until creamy. Seat aside. Dice the zucchini into ¼-inch pieces, using the outside portion (discard the inside) of the vegetable. Place the diced zucchini in a sauté pan over medium-high heat with 2 tablespoons of butter- season with salt and pepper- cook until lightly browned. Set aside. Place a large saute’ pan on the stove over medium heat. Add 4 tablespoon of butter- put the chopped onions, ½ teaspoon of salt, and 1 tablespoon of fresh cracked black pepper in the pan- cook slowly until the onions become caramelized. Next, add the Arborio rice. Stir the rice and onions together, making sure that all of the kernels become coated with the fat and cooked onions. Continue stirring until the kernels become a light auburn color- at this point, the mixture should smell slightly nutty. Begin adding the chicken broth/white wine mixture ½ cup at a time to the rice. It is essential to continually stir this mixture so that it does not become clumpy. Once the initial liquid is absorbed, continue adding the broth ½ cup at a time until it is all gone. Test the rice for doneness- the mixture should be firm to the bite, not mushy. Add the heavy cream and mascarpone cheese- stir. Lastly, add the sautéed zucchini, and processed butternut squash. Mix well. Adjust seasoning with salt and fresh cracked black pepper. 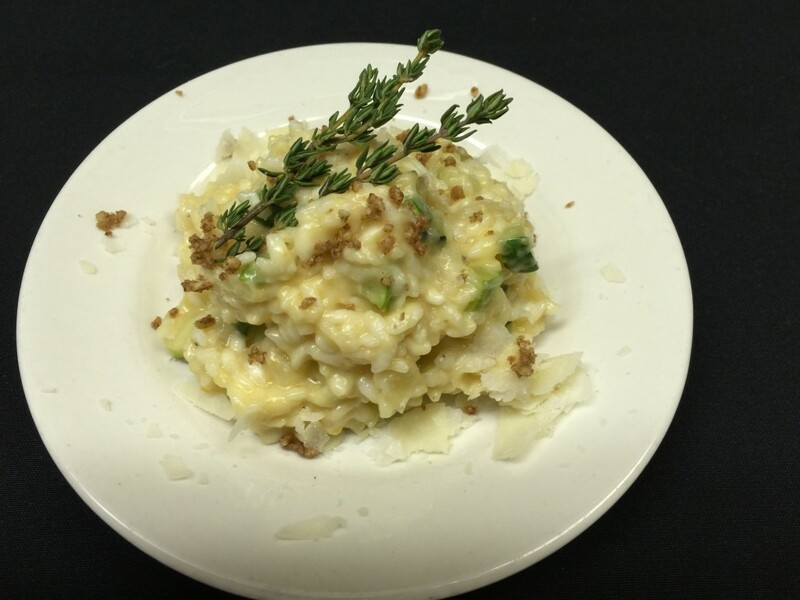 Place a small potion of the cooked risotto on a warm plate- garnish with pecan dust, chopped flat-leaf parsley, a few sprigs of fresh thyme, and Parmesan cheese. *TIPS The key to a successful risotto dish is all in the arms- constant stirring will ensure a creamy, evenly cooked product!